While Miss Universe 2015 Pia Wurtzbach was celebrating the New Year in New York, an effigy of her was being burned in Colombia, as shown in a video that is getting viral online. The viral video has made many Filipinos furious over what they consider as "disrespect" against the newly-crowned Miss Universe 2015 from the Philippines, Pia Alonzo Wurtzbach. Watch the said video HERE, which originated from Facebook, and now has many copies elsewhere including Youtube. The original uploader of the video is said to be Noider Almanza Barraza from San Felipe, Barranquilla in Colombia, who also burned an effigy of Steve Harvey, the host who made the terrible mistake at Miss Universe 2015. 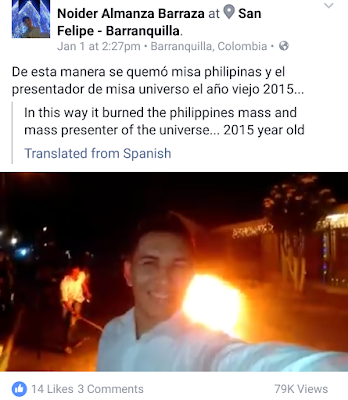 According to Barraza's caption of the video, he said that it was his way of celebrating the New Year by burning Miss Philippines and the Miss Universe 2015 presenter. 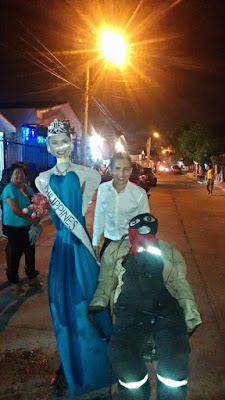 Noider Barraza was among the many Colombians who got really mad about what happened, and even made "attacks" against Miss Philippines, who actually was also a victim like Miss Colombia and shouldn't be blamed for the disaster that Harvey started.